The love and care for darling brothers is special. Go ahead and astonish them this Raksha Bandhan with beautiful and traditional rachis exquisitely designed for your loving brothers along with 100 gm Almonds and 100 gm Cashew. Astonish your darling brothers with this pearl rakhis duo accentuated with charming rudraksha. Take care of their health by pairing these rakhis with a basket full of dry fruits. 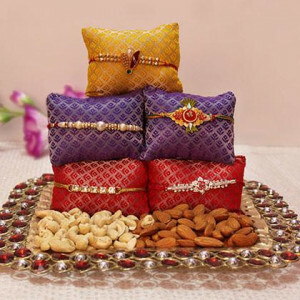 Adopt this rakhi combo that consists of 5 Rakhi with Roli Chawal and 400gm Dry Fruits Basket.